Yanmega in game: 248 Who? Important notice! Pokemon Yanmega is a fictional character of humans. Yanmega (Japanese: ????? 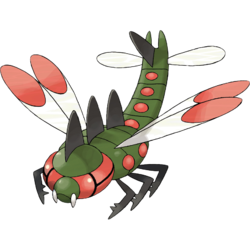 Megayanma) is a dual-type Bug/Flying Pokémon introduced in Generation IV. It evolves from Yanma when leveled up while knowing Ancient Power. 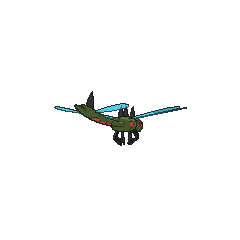 Yanmega is a large, dark green dragonfly Pokémon. Its large eyes are red with black lines that make a sideways "T" shape in each one. It has two large, white fangs or mandibles next to its small mouth. Its immense jaw power allows it to bite apart foes while flying by at high speed. Each of Yanmega's segments have a red spot on them, while the last tail segment has a black triangular plate. It has two similar plates on the back of its thorax and a third on its head. It has four white, oval wings with red tips, and there are two smaller white wings on the end of its tail. Yanmega can compose shock waves by beating its wings. These shock waves are so powerful, they may inflict critical injuries on the foe. Yanmega also has six thin, black legs. Jessie, after capturing a Yanma in The Thief That Keeps on Thieving!, used her in battle against Ash and his friends, where she evolved into a Yanmega in the same episode. Multiple Yanmega appeared in flashbacks in A Slippery Encounter!, One for the Goomy!, and An Oasis of Hope!. These Yanmega later appeared in the flesh in Defending the Homeland! and Beyond the Rainbow!. They are minions under a wild Florges, who had ordered them to attack Ash's Goodra's homeland in a flashback. They were then used again to attack Goodra itself. Two reappeared in Facing the Needs of the Many! and the following episode. Yanmega's first appearance was in The Rise of Darkrai. A Yanmega appeared in Arceus and The Jewel of Life. A Yanmega appeared in Diancie and the Cocoon of Destruction, under the ownership of Merilyn. 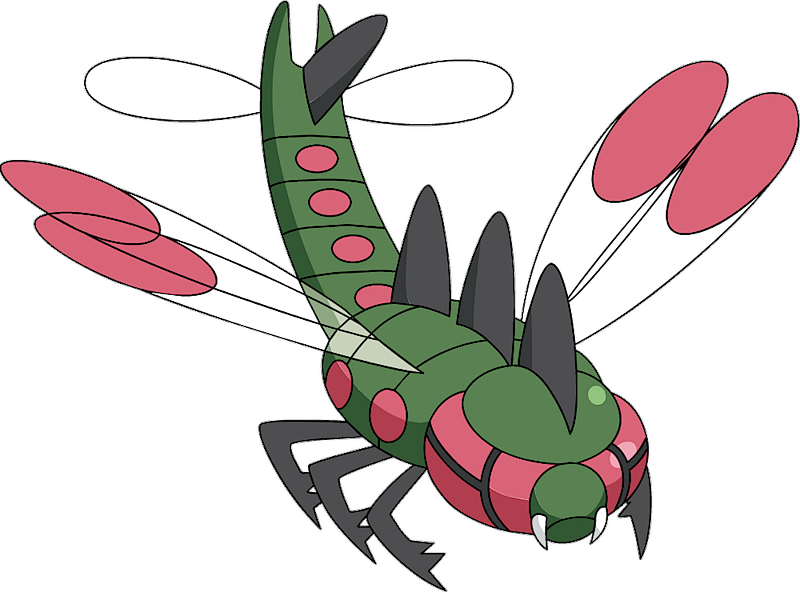 DP080 Yanmega Dawn's Pokédex Yanmega, the Ogre Darner Pokémon. When it flutters its wings, it composes a shockwave that can cause internal damage to its opponents. A Yanmega under Merilyn's ownership appeared in Diancie and the Cocoon of Destruction. Commander Mars owns a Yanmega. In the Diamond & Pearl chapter, it was ordered through a floating speaker-camera device to summon a swarm of Yanmega to infiltrate Professor Rowan's lab. The swarm dispersed after Diamond had Tru destroy the device with its improvised Razor Leaf. In the Platinum chapter, Mars' Yanmega faced Cheryl's Blissey. By churning its wings, it composes shock waves that inflict critical internal injuries on foes. Moves marked with a superscript game abbreviation can only be bred onto Yanmega in that game. It spits gooey silk. It attacks by letting loose shock waves. It lets loose supersonic waves and gusts of luminous wind to attack. For other sprites and images, please see Yanmega images on the Bulbagarden Archives. Despite having significantly higher Special Attack than Attack, Yanmega gives out 2 Attack effort values when defeated. Two generations after Yanmega's debut, Mega Pokémon were introduced. These Pokémon have the word "mega" in front of their names, similar to Yanmega's name in Japan. It is, as its name suggests, based on the Meganeura monyi, a particularly large, prehistoric species of dragonflies. Its species name suggests it's based on a green darner. Yanmega and Megayanma are a combination of ?? yanma (large dragonfly) and Meganeura (a genus of gigantic prehistoric dragonflies). Megayanma may also literally be "mega yanma".